Being the longest playing Broadway musical with 2844 performances at St. James Theatre, Hello, Dolly! the romantic comedy musical is soon going to hit a theatre near you. The acclaimed musical brings to stage the 20th century era with its set design, costumes and storyline. Tony Award winner, Jerry Herman has provided the music and lyrics, and all those who are familiar with his work haven’t delayed in buying their Hello Dolly tickets. Premiering in 1964 and charming the audience since then, Hello, Dolly! is based on the play The Matchmaker. The musical is critically acclaimed having received reviews like ‘Good-hearted fun’ by Variety, ‘A triumph!’ by The Washington Post, ‘Infectious enthusiasm!’ by Los Angeles Times and ‘One of the biggest, brightest musicals of this century!’ by The New York Times. The story revolves around a middle-aged widow who plays the role of a famous matchmaker. Due to her skills as a matchmaker, she gets hired by a millionaire to find for him an ideal wife. Dolly’s encounter with the millionaire, Horace Vandergelder, soon gets her into the realization that she needs to find someone for herself as well and settle down in life. She believes Horace would be a perfect husband for her and decides to woo him with her charm. To bring this whole story to life on stage, the role of Dolly is being played by the phenomenal actress Karen Ziemba. Having received the Tony Award, Drama Desk Award and the Outer Critics Circle Award for her performances, Ziemba is an ideal pick. Her co-star, David Lively (Jeff Award nominee), playing the role of Horace is no less talented. However, the musical doesn’t stand where it is today just because of the brilliant cast. People working behind the scenes have an equal contribution to the show’s success. The groundbreaking numbers like ‘Hello Dolly’, ‘Elegance’, Before the Parade Passes By’ and ‘Put On Your Sunday Clothes’ by Jerry Herman make your heart sing and your feet tap. While the hit music pleases the audience, the enticing scenic design by the Jeff Award winner, Scenic Designer Kevin Depinet itself is a treat for the eyes. The lavish scenery is further enhanced by Jesse Klug’s expertise on lighting which adds the wow factor to the overall set design. Further credit is to be given to the costume designer, Theresa Ham, who has created the dresses in such a way that they are a perfect fit and depict the elegant time of 1890s in its true essence. Moreover, the colors given to the costumes are vibrant which help create a very lively ambience. Other than the colors, the show-stopping dances help create a more spirited environment. Everything from the set to the music, to the costumes as well as the choreography, is worth watching and adds to the brilliance of the musical. Hello, Dolly! has bagged ten Tony Awards, all won in a single year for the best ‘Musical’, ‘Author’, ‘Costume Designer’, ‘Composer and Lyricist’, ‘Actress’, ‘Director’, ‘Scenic Designer’, ‘Producer’, ‘Choreographer’ and ‘Conductor and Musical Director’. Besides this, two Outer Critics Circle Awards were won in the year 1967-68. The list continues with The Drama Desk Award bagged in the year 1969-70. Since its debut, awards have been raining on the cast and crew, hence the eminence. Hello, Dolly! has been described as a full entertainment package. It promises you and your family a night full of comedy with melodious numbers to go with it. So, get ready to travel back in time as the musical will bring an ear to ear grin on your face and the dazzling costumes will make your eyes sparkle. Buying Hello, Dolly! tickets is a decision you won’t regret, so rush and reserve a seat for yourself right away. Fresh dates for the revival of one of the greatest musicals of all time, “Hello, Dolly!” have been announced. This 2017 revival is directed by Jerry Zaks and produced by Scott Rudin. Previews for Hello, Dolly! will start on 13th March, with the opening night on the 20th April 2017. Hello, Dolly! is returning to Broadway, starring the Emmy, Grammy and Tony Award winner Bette Midler. Milder seems a perfect fit for the lead comic role and this will draw many fans to the theater. Get your Hello, Dolly! tickets to enjoy classics such as 'It Only Takes A Moment' and 'Put On Your Sunday Clothes'. This new production is a tribute to the original director-choreographer Gower Champion. When the musical premiered on Broadway in 1964, it was a roaring success and this time it seems history is going to repeat itself. Some of the best theatre productions have released their schedules. Hello Dolly will run at the venues from 24-Apr-19 until 20-Oct-19. Upcoming show will be staged at Orpheum Theatre - Minneapolis, Minneapolis; whereas the last one will be held at the Thelma Gaylord PAT At Civic Center Music Hall, Oklahoma City. For the complete list of dates and venues, please visit our website. The average price for Hello Dolly Tickets start from $151. The minimum get in price is $13 for Hello Dolly Tickets at the Orpheum Theatre - Minneapolis, Minneapolis. For a detailed look at ticket prices and amazing discounts, visit our website. Q:What is the Hello Dolly Broadway Cast 2018? A:Hello Dolly a revival of the blockbuster 1964 musical of the same name boasts of an impressive 2018 cast. There is Bette Midler in the role of Dolly Levi and joining her is David Hyde Pierce as Horace Vandergelder along with a talented cast. The list includes names such as Kate Baldwin, Gavin Creel Taylor Trensch, Jennifer Simard , Will Burton, Melanie Moore to name a few. Find out more about the cast on the event page and do not forget to purchase Hello Dolly Tickets to see these artists perform live. Q:Who Is Barnaby In Hello Dolly? A:In the 2017 Hello Dolly, the character of Barnaby is being played by Taylor Trensch. Barnaby is a sweet naïve boy, a character that fans love to watch live. Trensch comes out with an impressive performance in this role, entertaining fans and doing justice to his role. To watch Barnaby get your Hello Dolly Tickets from the inventory put up by our certified brokers on the website. Q:Can you give me information on the front row hello dolly ticket sales? A:Hello Dolly Tickets have been selling crazy since the first day they went on sale with reports that it sold more than $9million on the first day of sales. Everyone is excited to see the Broadway revival with Bette Midler in the title role. The production is now selling its front-row orchestra seats as premium seats. The new "Telecharge Front Row Premium Seating" prices vary between $550 to $750. Check the exact prices from our website and the collection of tickets that our brokers have put there. Q:I need hello dolly musical tickets but wanted to know if children are allowed? A:When Hello Dolly made its debut on Broadway in 1964, it turned out to be s a huge success. It seems history is going to repeat itself. The revival is creating quite a buzz and Hello Dolly Tickets are disappearing real quick. For your information, children under the age of four are not allowed in the theater. If you are looking for more information and details about the event then log on to our event page. A:Bette Midler will play in the shows that had been already announced for the Broadway revival as tickets sales for these had begun. Two time Tony winner Donna Murphy will be playing the title role on Tuesday evenings and select dates from June 13th on wards. The details of when both the artists perform are given on the event page along with Hello Dolly Tickets, dates and schedules. Depending on whom you want to see in the title role, make your purchase and have fun. Q:I need Tickets For Hello Dolly On Broadway, but am a little apprehensive about purchasing them online, how safe is it? A:You need not worry about purchasing Hello Dolly Tickets from our website as our brokers are licensed and we have a totally transparent purchase process. That is why we command a loyal customer base who come back to us for tickets for every event. Put your apprehensions aside because we make sure that all transactions are carried out in a legal manner. We have been certified as safe by leading internet regulatory authorities. So relax and get your tickets to enjoy the musical that has everyone excited. Q:Are there any Premium Hello Dolly Tickets Broadway that I can purchase? A:The revival of the Jerry Herman classic is making good business since the sales of the tickets started. Everyone is excited to see the revival of the musical as it makes its way to Broadway again. Hello Dolly tickets have been in strong demand and people are willing to pay big money for the premium tickets and theses are going fast as well. To check for them go through the list of tickets put up by our brokers and get them before they disappear. Everyone is looking for the best seats to enjoy the experience that they know is going to be worth every penny spent. Q:Have the sales of Bette Midler Hello Dolly Tickets started and can I get any deal on this? A:Theater fans are anxiously waiting for Bette Midler's return to Broadway and Hello Dolly tickets are not only selling fast but breaking records. Bette is starring in the title role as matchmaker Dolly Levi. On the very first day of sales the musical made a new record for the best first day of sales in Broadway history. To see the legend on Broadway make sure you secure your tickets fast because the event is not very far off. And if you want to check on any deals or offers then be quick because these are always limited. Log on to our event page and check the list of available tickets and enjoy the musical that is the talk of the town. Q:Do you have Hello Dolly Broadway Tickets? A:Hello Dolly is back again! See the 2017 revival of the musical soon at the Shubert theatre. The first preview of the musical is on 15th March 2017 and the official opening date is set for 20th April 2017. 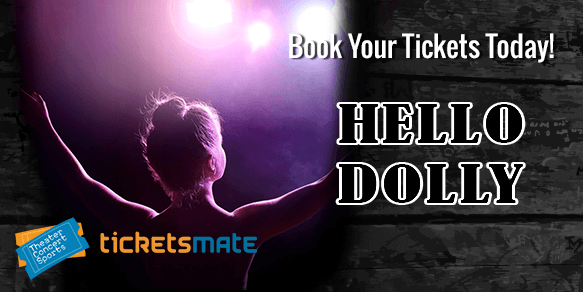 You can get Hello Dolly tickets from our certified brokers. To do this check the list of tickets available on our page and make your choice. Have a good time enjoying the romantic comedy starring the legendary Bette Midler in the title role. Q:Are you offering free Hello Dolly New York Tickets? A:The Hello Dolly Tickets you see on our website have been put up there by our brokers and they are not offering any tickets for free as such right now.